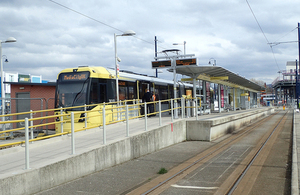 At about 22:55 hrs on Tuesday 12 March 2019, a passenger fell onto the track at Ashton-under-Lyne terminus tram stop on the Manchester Metrolink system. The passenger, who was in a vulnerable condition, had alighted from a tram that had arrived at the stop. He then leant on the side of the tram as it subsequently departed. Once the tram had left, he was no longer supported by it. He fell from the tram stop platform and landed on the track. He remained there until he was seen by the driver of the next tram to arrive at Ashton-under-Lyne. The driver of that tram stopped short of the passenger and summoned the emergency services. The passenger was taken to hospital. Our investigation is independent of any investigation by the railway industry, the British Transport Police or by the industry’s regulator Office of Rail and Road. We will publish our findings, including any recommendations to improve safety, at the conclusion of our investigation. This report will be available on our website.